If you and your spouse are in agreement about everything, then our Anniston divorce lawyers & attorneys may be able to help you get a quick and easy uncontested divorce in Calhoun County, Alabama. An uncontested divorce is where all issues have been resolved such as custody and property distribution by agreement and there are no contested issues for a judge to decide. The two of you sign your settlement agreement and file it with the Court and as long as the judge approved your agreement then there are no hearings and you get your divorce decree without ever having to step into the courthouse. An uncontested divorce is the simplest and most inexpensive way to get divorced in Alabama. If you are seeking a cheap divorce lawyer in Anniston, Oxford, Jacksonville, or anywhere in Calhoun County then call us today. We are currently charging $290 for uncontested divorces without minor children. We are currently charging $390 for uncontested divorces with minor children. This does not include the filing fee that each county requires to file your case. If you live in Anniston or Oxford then you will likely be filing divorce in the Calhoun County Circuit Court. The filing fee in Calhoun County is about $258. Call our Anniston divorce lawyer to find out the filing fee in your county. If you are considering filing for divorce in the Anniston area, then one of the first things to consider is whether the divorce will be contested or uncontested. If you and your spouse have already reached an agreement before the divorce is filed, then that is sometimes called an uncontested or no fault divorce. It is called an uncontested divorce because there are no contested issues in the case. The judge does not have to decide any unresolved issues since you have already reached an agreement by yourselves. Any other way that you file for divorce is usually considered a contested divorce since at the time the divorce is filed there are still contested issues to be resolved. If you live in Anniston or Oxford then your divorce (whether contested or uncontested) will most likely be filed in the Circuit Court of Calhoun County. Our Anniston divorce lawyers regularly handle matters in the Calhoun County Courts and the surrounding areas of Gadsden, Talladega, Sylacauga, Jacksonville, Oxford, and Pell City. We file uncontested divorces in every county in the State of Alabama, including in Calhoun County, Etowah County, St. Clair County, and the Talladega County. If an uncontested divorce is not possible, then you may need to file a contested divorce. Since there is no agreement in a contested case, the matter will begin with the filing of a Complaint for divorce. In the Complaint you will usually be asking the court to award you whatever it is that you want from the marriage and it will have to be delivered or served on the other spouse in accordance with the laws of the State of Alabama. Once your spouse is served this document, they have thirty days to respond by filing a document called an Answer. In this Answer, the spouse will usually be denying the claims in the Complaint and responding with a request for whatever it is that they want from the marriage. At this point, both sides either negotiate and reach an agreement or there will be a trial for the judge to determine these contested issues for the parties. If you do not have any significant property in the marriage and all issues related to the children have been agreed upon already, then you may be able to avoid such complexities by filing for an uncontested divorce. Give our Anniston divorce lawyer a call today for a consultation. Going through a divorce can be extremely difficult emotionally with both parties having to undergo life changing transitions. Often, both spouses do not want to have to intensify this already difficult process by fighting or arguing over their marital issues. In order to simplify the process, both parties will usually attempt to reach an agreement concerning all these issues before retaining a divorce lawyer in Anniston, in order to potentially file a cheaper uncontested divorce and lower the attorney fees involved. If you are seeking a cheap divorce in Anniston then call our office today for more information. An uncontested divorce is the quickest and easiest way to get a divorce in Alabama. However, it requires that you have already talked with each other and that both of you have reached an agreement. This means that you have already agreed on such things as how much child support is to be paid, physical and legal custody, visitation, property division, and all other marital issues. If you have not reached an agreement, then you cannot file a no fault or uncontested divorce. Most counties have their own unique local requirements in order to obtain a no fault divorce, such as having certain language included in your Settlement Agreement or other documents. In certain divorce cases, additional documents can be required depending on the terms that have been reached in your agreement. That is why it is important to retain a local divorce lawyer to file your uncontested divorce, to ensure that all local requirements are met and that you obtain your divorce decree as quickly and easily as possible. There are a few procedural requirements that are unique to Calhoun County Courts, but our Anniston divorce lawyers regularly file cases in this jurisdiction and are familiar with these local rules. In Calhoun County, you are required to take a parenting course and receive a certificate of completion in order to obtain your divorce decree. This is not a requirement in every county in Alabama, with there being no such requirement in Talladega County. This parenting course may be waived in extraordinary circumstances, or you may be able to take it locally if you live in another state. But if you live in Calhoun County, and do not have a sufficient reason to be exempted from this requirement, then you will have to do the course in order to receive your decree. There is also a filing fee that is required to be paid to the court when your divorce is filed, and in Calhoun County it is about $258 (which includes a small convenience fee for filing electronically). This fee must be paid prior to your divorce being filed and is not included in the flat fee price listed on this site in uncontested divorces. Our Anniston divorce lawyer Steven Harris, regularly handles divorce cases in the Talladega, Oxford, Sylacauga, and Pell City areas. The Harris Firm is a proud member of the Calhoun County Chamber of Commerce and the North and Central Alabama Better Business Bureau. Feel free to take a look at our profiles with these local organizations for reviews from former clients. 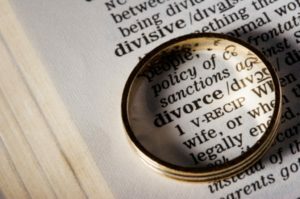 If you are seeking a divorce in Eastern Alabama, then give our Anniston divorce lawyers a call today. The City of Anniston is the seat of Calhoun County with the courthouse being located downtown at 25 West 11th Street. Our Anniston office is only a few blocks from the courthouse, located on Noble Street in the historic Lyric Square building. In the case of a cheap uncontested divorce, you do not usually have to come into the office and meet in person. This is because such cases are fairly simple, and an over the phone discussion or two can usually answer any questions or concerns that you may have. If you have questions about an uncontested or contested family law matter, then give our Anniston divorce attorneys a call for a consultation.